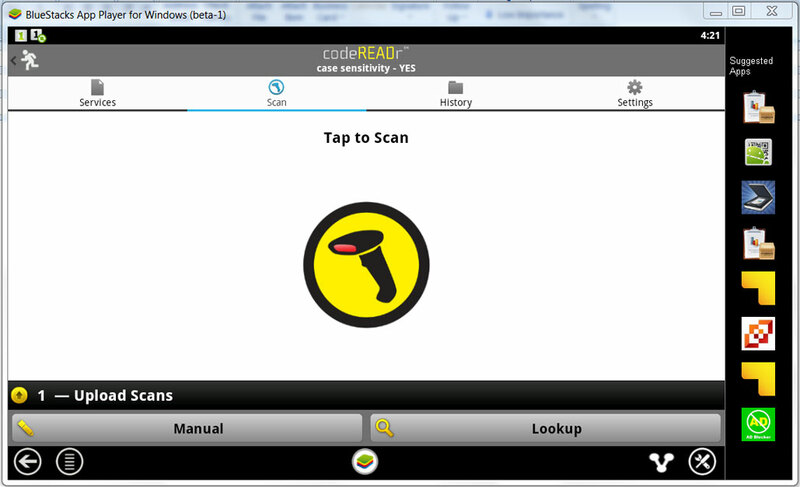 Want a barcode scanner for Windows PC or Mac? Want a barcode scanner for windows PC or Mac, so you can scan barcodes for access control, ticket validation, tracking attendance, tracking assets, and many other applications? Do you have (or prefer) a commercial USB or Bluetooth scanner and don’t want to pair them with codeREADr on iOS or Android devices? Well, now you can use the codeREADr app on PCs and Macs, through Android Emulator programs like Bluestacks or Genymotion. Search for the codeREADr app from the Emulator’s menu and download it. Enter your app username & password as you normally would and select your Service. Tap ‘Manual’ – the cursor should flash in the form field. Connect your commercial scanner. Then scan! Generally, you’ll want your commercial scanner to output a carriage return after each scan so you don’t have to hit the Enter key. Check the settings for your scanner – most include that option if it isn’t the default. For the fastest scanning, go to Settings on the codeREADr app and select Auto Next Scan which automatically records the scan and then presents the form again for your next scan. The device’s webcam is not able to scan barcodes themselves. We hope to enable that functionality at some point.